I was chatting on Facebook with my friend Tehlia last night, who writes two blogs, has a Twitter account, an Etsy shop, and a Facebook Fan Page. She’s an amazing designer of fabulous scarves, which my daughter can attest to, and she is quickly becoming connected in the communities that matter to her and her business via social media. I think she is doing an awesome job at it, but all that is besides the point of this post. Right now, I’m talking bacon scarves… because that’s what we were talking about last night. I mean seriously, does it get any nicheier than writing about bacon? You don’t have to answer that… Tehlia was contracted to crochet a scarf that resembled bacon for a woman who writes a blog called, You had me at Bacon. The comedy, right? She ended up cranking out this stunner which is a ridiculously awesome rendition of @smorty71’s favorite swag from SXSW. So we were chatting and I told her a few things she could do to get more targeted exposure for the bacon scarf, to see if there may be more demand out there. I came up with this method when trying to figure out how I could market @mathiask’s I am Choking iPhone app. Because let’s face it, it’s pretty niche in its own right. So here are the methods that I shared with Tehlia last night. google blog search Obvious and necessary all at the same time. The Google Blog Search is a staple in every social media practitioner’s tool box to sniff out topical blogs around various niches. For these purposes, I found it more useful to use the Advanced search feature for the word bacon in the blog’s title. 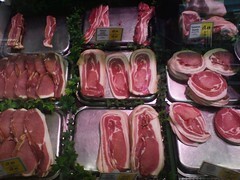 That seemed to return better results for what I was looking for in this instance, blogs about bacon. But feel free to mix it up to suit your individual needs. spreadsheet The tried and true method for most people. Making columns for the pertinent details around names, links, and notes will really help you stay organized. twitter lists I enjoy making lists of the people who I’ve gathered up, and importing them into Tweetdeck, because then I can see what they’re talking about and possibly comment or reply on what they are saying. When I do this over a period of time, without asking for anything, then I become familiar. I made a bacon scarf that I thought your readers may enjoy, based on this post you wrote in September 2008. It would be really cool if you were able to write about it on the Royal Bacon Society. It’s really not that hard to find, organize and reach out to people around specific niche topics with all of the free tools available to you online these days. How do you like to attack this situation? Please let me know in the comments below. Great suggestions…I know the scarf is going to be appreciated! You gots some SEO skills, bye!